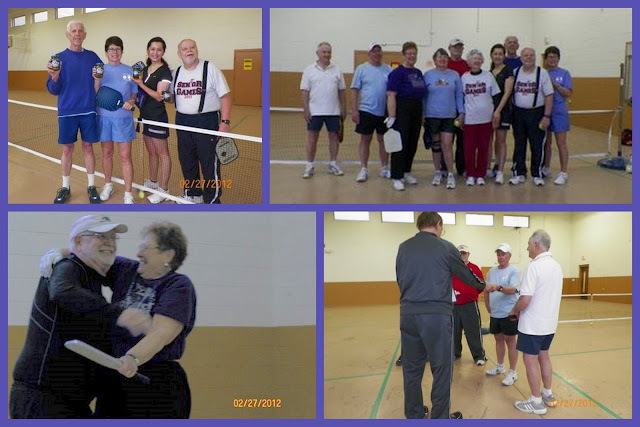 The Macon County, NC, Pickleball Group held an "in-house" tournament February 27, 2012. It was the First Annual " Winter Die-Hards Pickleball Round Robin Tournament".....a celebration for all those who are full-time residents and play Pickleball all year long! We have been fortunate to have a mild winter compared to the last several winters, but we all really enjoy our indoor-facilities at our National Guard Armory. We have 3 courts for play and for most of the winter we use all 3! Larry Noyes organized and ran our "Winter Die Hards" Round Robin and it was great! We had 12 participants, paired randomly by picking numbers, and divided into two divisions.....all levels playing together. Each player played a total of 6 matches with different partners. Total games won, total points won, and the tie-breaker was total points lost....which as luck would have it, we needed to break a tie! The 1st and 2nd place winners in each division played one match to 7 points, and the winners of that match, played one match to 11. First Place Pickles went to Ron Schott and Nancy Falkenstein and Second Place Pickles went to Vince West and Mei Gooder. Vince has recently undergone a Kidney Transplant at Emory in Atlanta, receiving his wife Mary's kidney. We are all thrilled he is back at Pickleball and winning. We are looking forward to our Senior Games which open April 23, 2012, and Pickleball is a "Fun Event". We, like others in North Carolina, hope that the State will soon sanction Pickleball as they did "Corn Hole" this year! We know several are working on this. Our summer folks will soon be returning, and we will be moving outside to our 2 dedicated Pickleball courts at Macon County Rec Park. The outside game is different from indoor Pickleball and we all look forward to that! We often have as many as 30+ folks in the summer, while our winter group is about 12 to 15. We continually recruit new folks and are pleased to report we introduced John Miele of Sylva, NC, to the game recently. He comes to Franklin regularly to play tennis; we found him on a "rain day" and he joined us. He will be good player and we hope he keeps coming! We are happy to learn that one of our own summer players has recently become and Ambassador and is getting the game going in Pensacola, Florida! It keeps on growing!